“No.” I think I said it out loud, but it sounded more like a gurgle. I tried harder. “You will give it to me now. Or else your brother will end up like this.” He grabbed one of the undead and pulled the grotesque, dead-eyed face down next to mine. Then, he tossed it away like a stick. This was the end, then. Gore had won. I had to at least try to save my brother, even if Gore’s promises were lies. With unbearable effort, I reached up and tried to undo the chain. I couldn’t. I tried to pull it up over my head but somehow, it became tangled in my torn clothes. I was too weak and the problem of removing the key from around my neck overwhelmingly impossible. FIGHTING YOUR WAY TO BEING A WRITER! I am a single mother and I raised three kids, two boys and one girls. It wasn’t easy. I also was determined to be a writer. My mantra is #writeordie. WRITE OR DIE. I have to write. I have to be an artist. I have to be true to my calling. And I also have to be a mother. How to blend the two when they both require an intensity and a focus of purpose that is grueling and time-consuming? I have found my way through training in marital arts, boxing, kick-boxing and Eskrima, which is Filipino stick and knife fighting. Yes, I am a virtual killing machine and as a woman, I love it. I was even asked a few years ago by a rapper to be his body guard. How about that? So, it is hard to believe that once I was in an abusive marriage, isolated from friends and family and lost. What saved me was I put on a pair of running shoes and I started to run in the park. I lived in London at the time, near Kensington Gardens. 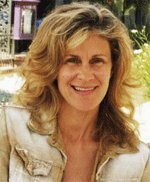 I had no money, I was under the control of my “rock star” husband. But I had a pair of shoes, and I could run. Each day, I pushed myself a little bit further and through that experience, I was able to eventually leave my husband. When I returned to the United States with one suitcase and my four year old daughter, I started training in martial arts. From there, I took up Eskrima, and then Okinawan weapons. Eventually, I started fighting full contact in boxing and kickboxing. I now know what it feels like to stand up straight and tall and not be afraid, knowing that I can defend myself. I will either win, or go down trying. It gives me great satisfaction to train other women and girls in the gym, to empower them to know that they can defend themselves. Nearly one in five women report being sexually assaulted in the United States every year. Keep in mind, that is what is reported, so the numbers have to far exceed that. In my series, the Night Angels Chronicles, one of the important factors is that the female lead, Sera Patterson, develops through the course of the series into a superhero who can stand on her own two feet and defend herself against any foe. Yes, she has a hot love interest, that goes without saying! But also, unlike so many books being published for the female audience, she has her own identity apart from a man and she is self-sufficient. This is of paramount importance because I know what it feels like to be powerless and to live in fear. As a result, I want to do everything I can in my writing and in my life to inspire women to stand up and fight against abuse. To this end, in 1995, I started a creative writing program in juvenile hall, in Los Angeles, called InsideOUT Writers. I first began working with group of girls, all facing life sentences for serious crimes. More than twenty years later, I still know many of those girls and they are incredible. Many spent long years in prison but are now out and married, have careers and children. Never write off a teenager as a lost cause. My dedication of Key of Mystery is in part to the young people who congregated at my house and inspired me with their stories. I really hope that my series, starting with Key of Mystery, will inspire girls and women to stand up for themselves and to learn how to fight! My training also means that I can write fight scenes from the perspective of actually being in the ring and fighting full contact, fighting with weapons, and knowing what it is like to be abused, to be hit and kicked and to live in fear, and then to overcome it. So let’s make the Night Angels a world view for women and girls. Let’s get women around the world to unite behind this series, from the Middle East to the Far East to the Western World. We should all stand up and take charge of our love lifes! If someone touches you, kisses you, takes you down to the floor, it should be your choice, not something you feel pressured to do. In my series, Sera does not give up her identity for the sake of a relationship with an overbearing vampire who wants to control her. She grows as an individual and learns how to hold onto her power. Sera rocks! And so do we all! Karen Hunt is the author and/or illustrator of nineteen children’s books and the co-founder of InsideOUT Writers, a creative writing program for incarcerated youth in Los Angeles, and the founder of the MY WORLD PROJECT, connecting youth who live in remote, violent and poverty stricken areas around the world through art and writing. She is a 2nd degree black belt in Tang Soo Do, a first degree brown belt in Eskrima, and a boxing and kick-boxing trainer. Switzerland and smuggled Bibles into communist countries, to name a few of her adventures. As an adult, she continued her adventures, living between London and a village in Yugoslavia. She writes her YA works under the name KH Mezek. 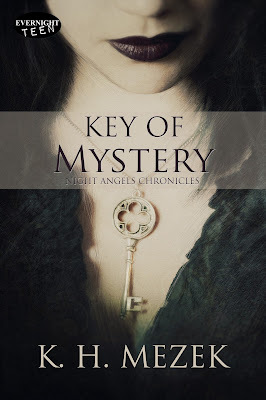 Key of Mystery, book I in the YA Urban Fantasy series, NIGHT ANGELS CHRONICLES, was published February 5, 2016 with Evernight Teen. Guest Post from Nicky Peacock featuring her series Battle of the Undead (Bad Blood #1 & Bad Timing #2) w/a rafflecopter giveaway! shouted. I heard a cough and saw a tall, well-built man slip from the shadows. his eyes were far too blue to be natural. friend or foe.” He nodded at me. waiting for me to smell it. pulled my axe back so I held it by the handle and it rested on my shoulder. whiff of blood, live human blood. “In the store room, back there. munching on scared survivors? What an asshat! voice. There was a collective shiver that even caught me in its terrible wake. Whoever this vampire was, he was truly living up to monster status now. to be like, just with slightly less feeling and more order. heard of me, the lack of blue hair had been what had put him off the initial recognition. the shop. I might never have discovered his little person larder. those were usually the ones that the Elders sent me after. head. It tumbled down the flat screen TV section. tea with – better the devil you know. all-you-can-eat zombie buffet conga line. sometimes take a while for the magic to leave older vampires. removed all their blindfolds and counted them: twelve. us.” A young girl of no more than thirteen cowered near me. I turned to her. out a fat tear that rolled down her ruddy cheek. the door and into the main shop, out of the eye-line of the humans. their bare hands. I gagged and quickly closed the door. The cast of Bad Timing. Britannia – Emma Watson. I think that she is an amazing British actress and just perfect for Britannia. She could make her both funny and serious at the same time. Nicholas – Andrew Garfield. Perfect to play a dark, brooding but slightly comical complex character that has more to him that meets the eye. Josh – Liam Hemsworth. Hunky solider who takes action in his stride and turns Britannia’s head and heart. Phillipe – Tom Hiddleston. Great actor who can play the loving guardian to Brit one day and the evil Vambie chaotic killer the next. Jack – Nicholas Hoult. A truly brilliant young talent who can embody Jack’s sensitive and caring nature that helps Britannia take back a precious part of her soul. Ichabod – Orlando Bloom. Although I’ve only ever seen him play the villain once, I think he could breathe dark life into this vengeful vampire who has more than one axe to grind. Lyle – Jeremy Irvine. Cheeky, calculating but above all loyal. This talented War Horse star could give Lyle the depth he deserves. Tate – Daniel Kaluuya. I loved him as Tea Leaf in BBC’s Psychoville and was always Tate in my mind. Strong, caring and totally determined to protect those he loves. Xyla – Sandra Bullock. Ironic casting as it’s said more than once that Xyla looks just like the bubbly US actress. Mariah – Hayden Panettiere. My guilty pleasure is Nashville and I think that this beautiful blonde’s strength and confidence will make Mariah a character to be reckoned with. Betty – Elle Fanning. Although only briefly in the book, Betty deserves to be played by a rare actress who exudes sweetness. Here’s your chance! 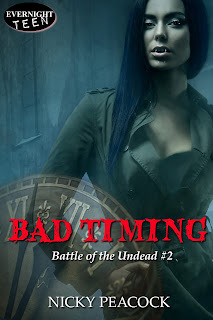 In honor of the release of BAD TIMING, the second book in Nicky Peacock’s Battle of the Undead series, she will choose and feature a character created by one lucky reader in the last book of the series, BAD KARMA. 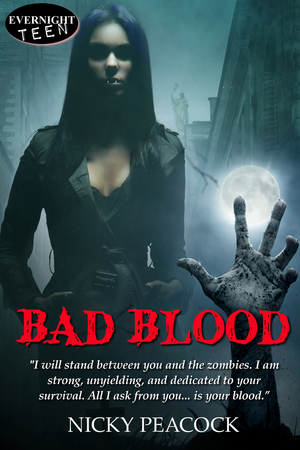 deliver him to the safe hold?Survival instincts run deep, but bad blood can run deeper. Nicky is a published author of both YA and adult urban fantasy, paranormal romance and horror fiction. She lives in the heart of the UK, where she has run a writers’ group for over 4 years to help new writers find their feet on the path to publication. A member of both the Society of Authors and the British Fantasy Society, Nicky has had over 30 stories published in various anthologies. Bad Timing is her second book in the Battle of the Undead series published through Evernight Teen. She loves to talk to readers, so please feel free to either get in touch with her through her blog, or on any of the social media below.